Today I read another long awaited book Jasmine In The Wind by Ayesha Desai. Jasmine In The Wind is a quick read. It is a story of a little girl from Syria. This 40 page novel clearly expresses the feeling of a refugee. This young adult fiction is all about the challenges, trials, and unending optimism and strength of a young Syrian refugee. 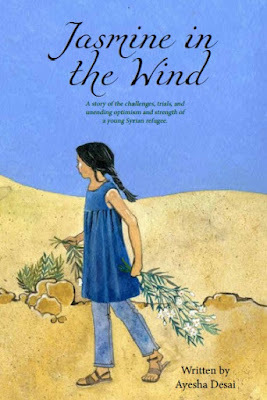 We all are aware of what is happening in Syria and Jasmine In The Wind allows us to peek in one of their lives. The story follows a young Syrian girl, Afraa and her harrowing journey to safety and freedom. Whilst she learns to love her new home, a part of her heart will always be buried in the roots of the jasmine bush outside her parent’s room window in Syria. About the Author - This is Ayesha Desai’s debut novel. We get to see her love and passion for things close to her heart. Ayesha is passionate about reading and this has evolved into a love of writing. Whilst this is her first published book, she has been writing for the last 20 years, and blogging since 2013. She lives in South Africa. Ayesha's narration is beautiful and emotional. I loved her writing style. With each words, she has painted the picture of the challenges that every Syrians face and, I was moved by the entire story. 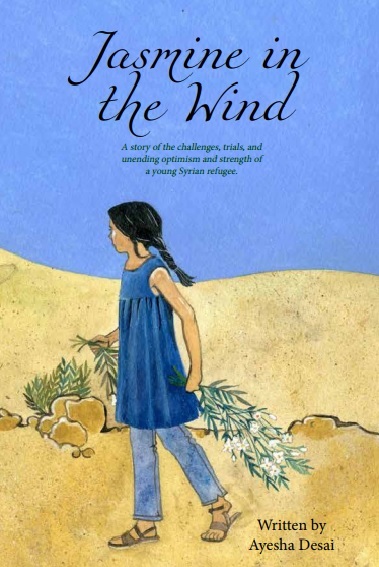 Jasmine in the Wind is a touching tale of Afraa who was traveling out of Syria. It is all about her journey and how she deals with her situation. She was safe in another land but there was a hollow in her heart, as she misses her home. Far away from her home, being a refugee in another country, she was trying to accommodate while she still longed for the scent of her home. Also she never missed an opportunity to educate herself and to make a better tomorrow. This short novel is a nice read. I particularly loved the poem in the end. Do you carry messages across the lands? Can you take my Salaam to Aleppo and Homs? Can you take my prayers to Gaza? Can you convey my solidarity to Myanmar? The story ends with hope and it is the beginning of a new life. The story and the poetry both poignant and touching. Jasmine In The Wind is a heartwarming tale and it is sure worth the read. Sometimes I like to slide a quick read in. To follow this little Syrian refugee sounds like an interesting story to a world I don't know. Wow reading about the experience of a Syrian sounds really neat. I know I could never fully understand what she has gone through, but I feel like this book would help us all to understand just a bit better. Thanks for the review. It sounds like a well written book about a poignant subject. I will have to add this to my reading list. This sounds like a really great book. I'll have to pick it up. I imagine my heart will squeeze as I read it. That poem brought chills to me! It's seems so full of emotion and the books sounds like an interesting read. OH it sounds like a really good and insightful read, not to mention emotional. I'll definitely look out for it. This sounds like an important book! I'm going to look into getting it for my little sister who is currently reading YA novels. It seems like an interesting story. As a person who lives away for my hometown, I can relate, but not to her level. Thank yours for sharing. Seems a beautiful book with an intriguing story. Should be apt for my 10year old niece. We all live with challenges and it's good to know there is always hope, no matter how dark it seems. Great book choice. The plot of the book reflects reality of current times. I will try to get my hands on this book. High Five - Happy Birthday, A Rat’s Nibble!